Nokia Asha 305 review - Nokia Asha 305 is equipped with two slots for SIM-card has a 3 inch touchscreen WQVGA, 2 megapixel camera and a slot for smart cards microSD. Supports work on the GSM and EDGE and offers Bluetooth 2.1, microUSB 2.0, 3.5-mm headphone jack, accelerometer and a battery of 1100 mAh. The model has dimensions 110.3 x 53.8 x 12.8 mm. 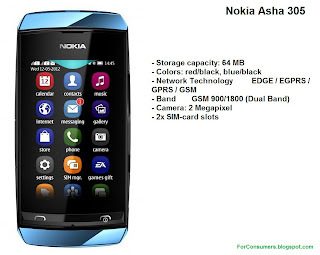 and weighs 98.3 g.
Buyers of Nokia Asha 305 will also get 40 games from EA and Nokia Browser, in some countries, the device will be installed and service Nokia Maps. Built with the candybar form factor, this unlocked Nokia Asha comes equipped with the Series 40 UI operating system. A 2 MP digital camera is integrated in this versatile red Nokia Asha 305 mobile phone, which features the following options: self-timer, white balance, exposure control, effects, and digital zoom. The camera has the aperture size of f/2.8 and also allows the user to record videos. The resistive LCD display in this versatile feature phone has a resolution of 240x400 pixels, while the pixel density is 155 ppi. Thanks to a battery with the capacity of 1,100 mAh, the Nokia Asha has a standby capacity of up to 22 days and can last for 14 hours of talktime. Music playback reaches 40 hours, while video playback is 9.5 hours. Users can surf the Internet with the Nokia Asha 305 mobile phone by using the Series 40 OSS browser. Twitter and Facebook applications are already built in to the device, and this feature phone also supports Yahoo!, Google Talk, as well as Windows Live instant messengers. Measuring 110 mm by 54 mm by 13 mm and weighing 98 g, the Nokia Asha is a lightweight and compact device. Asha 305 and 306 are equipped with 3-inch resistive screen with resolution 400 x 240 pixels, 2 megapixel camera, FM radio, music player, support for second generation networks. The first version supports two SIM-cards, while the second boasts Wi-Fi. Asha has received 311 3-inch capacitive touchscreen with the same resolution as in the first two models, but also polarizing filter improves visibility in direct sunlight. Also, the device has Wi-Fi, 3,2-megapixel camera, a processor with 1 GHz and supports networks HSPA. Nokia said that any new owner will be able to download 40 games from EA for free. 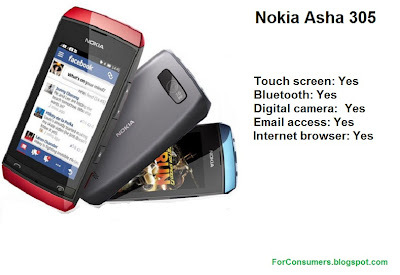 In addition, Asha Touch preinstalled Nokia Browser 2.0, customers on Facebook and Twitter. The price of Nokia Asha 305 is 65 Euro, Nokia Asha 306 - 68 euros, while the Nokia Asha 311- around 92 euros. 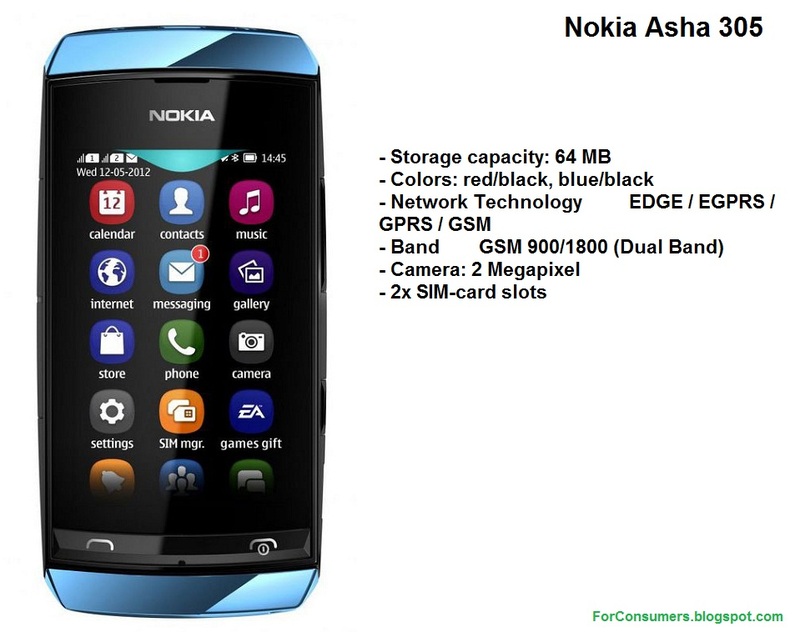 Nokia Asha 306 has the same features as 305, but supports WLAN and review of the video stream as well as via GPRS, and via WLAN. Nokia Asha 305 is available at price of 65 euros.